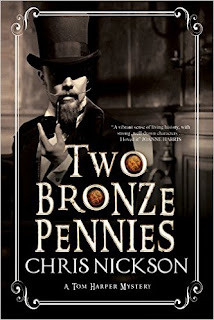 As with many of Chris Nickson’s books, this one is set in Leeds. It’s the most recent outing in the author's newer series featuring Detective Tom Harper, and is set in 1890. Tom is recently married to Annabelle, who is the landlady of the Victoria Pub, and manages a couple of local bakeries. It’s December, Christmas Eve, and cold, when Harper is called out to the Jewish quarter of the city: the Leylands. The body of a young man, stabbed, with two bronze pennies covering his eyes, is laid out in the street. The young man, only seventeen-years-old, is quickly identified as the rabbi’s nephew, Abraham Levy. Is the murder something to do with the local hatred of the Jews? Was the perpetrator someone involved with a shady group, who meet in pubs and plan violence? Are they working on their own, or is someone organizing their actions? As well as investigating the murder, Harper has something else to keep him busy, the imminent arrival of a French detective, Bertrand Muyrère who’s coming to try to find out what happened to someone called Louis Le Prince, the inventor of moving pictures. The Frenchman who married a girl from Leeds, invented his camera and disappeared during a visit to France, somewhere between Dijon and Paris. Harper has been asked to help Bertrand interview the family and help him with his investigations. An interesting mix of stories, and backstories ensues. Sergeant Reed goes undercover to find out more about the group of thugs that might be involved, putting his own life in danger. There is a wealth of interesting detail about the life of the Jews in Leeds, and the various prejudices. The Jews themselves feel threatened, don’t trust the police and have their own vigilante group, the Golem, which tries to protect them from harm. More murders ensue, but slowly and surely Harper discovers the perpetrators. A good mix of characters, and some nice historical detail make this an enjoyable read.